There’s nothing quite like a holiday with friends. Whether you’re booking a trip with one or ten people, the excitement about new adventures with your best buddies is about to get real. Having travelled with friends before, both long and short term, I also know that these kinds of holidays involve a lot of planning. Unlike solo travelling, you need to coordinate with your friends and make sure you are all on the same page, so here are some handy tips to make sure you (and your pals) make the most of your holiday! Before anything’s even booked, there will be a tonne of ideas floating around and yes, you guessed it, keeping track of everyone’s suggestions will be hard. Understandably, it’s difficult yet imperative to make sure all voices are heard, so one way to do this is to create a Google Doc or Facebook group. All the information you need for your upcoming trip can be written in there, from different types of adventures to your hostel options. It’s much simpler to organize when everything is laid out for the whole group to see and it’ll also make it easier for everyone to have their say. Crossing the Brooklyn Bridge with my pals in New York. Budgeting is usually the least fun part of any holiday, but when travelling with friends, it’s one of the most necessary things (apart from counting the number of Wednesdays on your trip so you can pack the corresponding number of pink outfits, duh). You may find that everybody’s personal budgets are slightly different, and that common ground needs to be found. This will hopefully save you from running into issues further down the track that could have been avoided with a bit of planning and understanding. Once you know how much everybody is willing (or able) to spend, you can go ahead and find hostels in your price range, figure out how you will be getting from point A to point B, and see what tours you want to do. Create a separate personal and group budget so that the vital parts of the holiday can be booked together, ensuring everybody is on the same page. You know that Google Doc I mentioned above? Well, it’s time to use it again. Your friends are probably going to have slightly different priorities: say you’re heading to Paris, one of you might want to take a day trip to see Montmartre, while the others explore the Louvre, so make sure you know what everyone wants to do and see on your adventures. This way, everybody can come away from the holiday happy and with their bucket list checked off. The Grand Canyon was definitely somewhere we all wanted to go! Once you have your budget and priorities sorted, the next thing to do is to figure out the best way to handle money and payments for everything you plan to book together. Money can be one of those things that make or break your holiday and friendships, hence a money strategy is definitely in need when travelling with friends. Most hostels are happy to take split payments, but there will be times you need to pay for things together and that’s important to sort out in advance. There are lots of split payment apps you can use, like PayMeBack, which you can share with your friends to ensure everybody has the same information. Venmo is a quick and easy way to transfer money, and if you keep an open dialogue with your friends about the money, it should be smooth sailing. As much as we hate to admit it, sucky things can happen while you’re away, so it’s good to have a quick think about them before you head off on your holiday. I sprained my ankle in Macedonia and had to take three weeks out of backpacking, but my friends and I had already decided what we would do if that happened – which made the situation (and our lives) a whole lot easier. We can all hope that nothing bad happens, but if you get sick, or your friend has a family emergency, it’s good to know where you stand. It’s not fun when things go wrong on a holiday, particularly when you’re in a beautiful place with your friends and all you want to do is soak up the atmosphere and make amazing memories together. Fortunately, your friends can be an asset to you during rough times, and it’s best to remember not to sweat the small stuff. Tours get cancelled, monuments are closed, but this doesn’t mean your whole trip is ruined. Embrace the bad and see where it takes you. My friends and I made this rule called “quiet time” where we would all go off and do our own things, just to get some piece of mind. Of course, it’s really great being on a holiday with friends but you will also need your own space. Plus, this means when quiet time is over you’ll have a whole new lot of stuff to talk about! One of the best things about travelling with friends is the safety in numbers. Often at times when you’re travelling solo, it can be a little scary to go off the beaten path, but a holiday with friends might just be the perfect time to embrace it! Visit a town you’ve never heard off or jump on a bus and experience the unknown. Spontaneity is sometimes the best part of a holiday, and the memories you’ll make will stay with you all, forever. This seems like a really obvious one, but it’s also something that is so easily forgotten. I have left cities with hundreds of photos of buildings and sunsets, but no pictures of me and my friends. Come up with a signature pose or a routine to make sure you get those group pics in. You won’t regret the selfies, I promise. The good thing about holidaying with friends is the inbuilt support system you already have, so joining in on hostel activities is a breeze. From tours to nights out, hostels have excellently organized trips, and you will meet even more friends in the process. Don’t shut yourself out from anything just because you’re surrounded by your favourite people, you never know who else you could meet. Ready to book your holiday with friends? Discover the best hostels for your adventure. Travelling with serious squad of 15 or more? Our group travel specialists are here to help. Azra is a writer who can be found wandering the streets of different cities, confused by how she got so lost. Follow her adventures on Instagram. 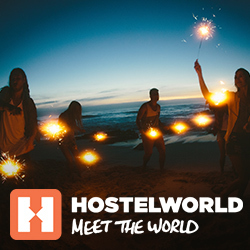 The post #SquadGoals: how to plan the perfect holiday with friends appeared first on Hostelworld Blog.